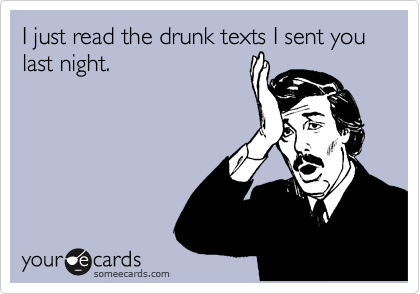 Can a drunk text ever do you any good? We will find out today as I share my experience of drunk texting my contact list on Christmas eve. We all have a handful of these people, friends & acquaintances we haven't talked to for a while and it gets weird for us to reach out to them. But there is something about Christmas and New year (and also thanksgiving) that it becomes not so awkward to text random greetings to these people. Usually on Christmas day right at midnight, I get text messages from random friends and acquaintances who would wish me a merry Christmas. Often times I would respond to them and we would reconnect sometime in the new year over coffee or at a gathering. Text was sent at the worst possible time: 3:33AM Christmas day. This text was hastily made after I had a few glasses at a Christmas party to show that you can never be too busy to wish friends a friendly Merry Christmas greeting. Text had a few grammatical errors due to a few insertions made. Wishing you all a Merry Christmas day with you family and friends and a happy 2015 year. I haven't seen some of you for a while, Let's reconnect and catch up in the new year. Feel free to drop me a line/text. Within 12 hours, I got back 14 responses from people I haven't talked to/seen for over a year and a couple even took up an invitation to catch up in the new year. Sadly some had moved on/changed numbers with their numbers being out of service. But it was great following up with those who have responded, hearing about what's new with them. It was definitely an interesting experiment conducted with influence of alcohol. The power of a kind greeting can go far and can mend long lost relationships. New years eve is coming up, if you are looking for an opportunity to reconnect with long lost friends, this can be an opportunity to reconnect. Edward has been sitting at the sidelines of life observing his charismatic peers basking in the spotlight. Ever since his 'great encounter' and the discovery of his 'Anchor', Edward has found strength and direction to overcome his fears of interacting with people in a social setting and establishing the fact that "change is possible" with true wisdom and perseverance. Today Edward is actively engaged with the community from volunteering for community festivals to serving on multiple Toastmasters clubs, from organizing meetup celebrations for his 2000+ member group to being a facilitator mentor to young teens transitioning to high school. Edward believes that life is not about himself but he is living for something greater than life itself! He gives himself a goal and personal life mission to constantly add value to others; it may be as simple as complementing someone's hat at a party or saying "Thank You" to the bus driver. Edward seeks to inspire friends and encourage them to pursue a significant life, living a life grounded in Truth that is worth living for and leaving behind an everlasting legacy of positive impact.